Boroughmuir Blaze were the only winners on a thoroughly depressing weekend for Edinburgh’s basketball teams. Blaze had beaten local rivals City of Edinburgh Kings the previous week and they produced another convincing display to outclass Stirling Knights 108-56 at The Peak. The visitors led 41-28 at half time and really hit their stride the second period, inspired by 14 points from Cameron O’Donnell. 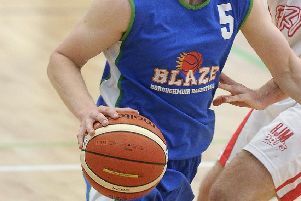 Blaze now share fourth place with Kings after coach Craig Nicol’s side squandered a 14-point first-quarter lead before going down 84-71 to deposed champions St Mirren at Portobello High School. 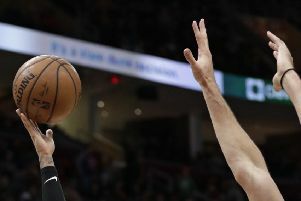 It was still 46-36 to the home team at half time, but Saints edged closer in the third quarter and then dominated the closing ten minutes to win with plenty to spare. Elsewhere, Edinburgh University fell apart in the latter stages at Grangemouth Sports Complex as Cup winners Falkirk Fury strengthened their grip on second place with a commanding 100-58 victory. Last year’s Division Two champions Edinburgh Lions failed their examination at Glasgow University when the students triumphed 86-71 at the Stevenson Building. In the women’s league, City of Edinburgh Kool Kats tasted their first defeat of 2019 following five straight wins after losing narrowly to St Mirren at Portobello High. The Paisley club’s 61-58 victory clinched second place behind new champions Lady Rocks, and Kats can now finish no higher than third going into the end-of-season play-offs. Edinburgh University joined their men’s team in losing to Falkirk in Grangemouth, but this was a desperately close game which was all-square at half time and finished with Fury 62-60 in front. Pro outfit Caledonia Pride have now managed just one win in eight since the turn of the year, although Saturday’s WBBL defeat to top-of-the-table Leicester Riders was not unexpected. Despite injury problems, Pride dug in and limited their losses to 85-66 at The Pleasance. Tia Weledji topped the scoring charts with 25 points, while Sian Phillips continued her recent sparkling form with 14 points plus 12 rebounds.